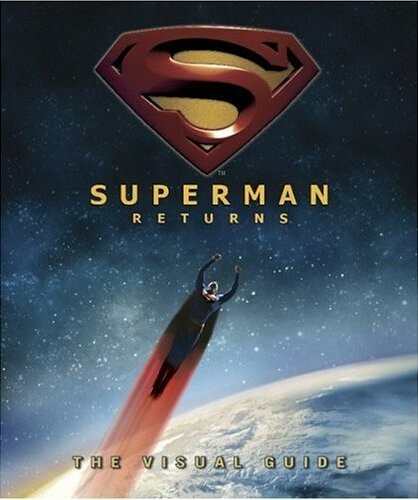 This 72 page book is a must have for all fans of "Superman Returns". It references in detail all the main characters and locations, explores the story of the movie, while putting forth fresh material never seen before in any other medium. The book starts off with a "Superman for all Seasons" Forward by Marv Wolfman, introducing the character of Superman from his "Action Comics #1" debut in June 1938, and also introducing the concept behind the 2006 movie. "Who is Superman?" gives a quick introduction to the way Superman first appeared on the scene as seen in "Superman: The Movie", and then goes on to explain that Superman vanished for five years without anyone knowing where he'd gone. This page does a great job explaining Superman's motivations for leaving, "Superman has made a long trek to the planet of his birth. Against all odds, he hopes that Krypton somehow survived and that his birth parents may still be alive. Only they can reveal to him where he truly belongs in the universe." "The Birth of Superman" explores Clark's teenage years on the Kent Farm in Smallville. It talks about Clark discovering his powers, experimenting with his new-found abilities, and discovering his alien origins. Interestingly, it examines a deleted scene from the movie, where 15 year old Clark stumbles on his baby spacecraft in the barn cellar, where he finds the "Father Crystal" he'll later use to create the Fortress of Solitude. "Where Has He Gone?" tells us about Superman's disappearance, and how over the ensuing years reports lessened about his disappearance, with people learning to get on with their lives without the Man of Steel. Of interest is a Daily Planet front page image with the headline "Is It Krypton? ", showing a photo of deep space with one particular star circled. The caption text next to this newspaper image reads, "Data recorded by NASA's Cassini-Huygens satellite from a vantage point near Saturn suggested that Krypton's star did not suffer the catastrophe that Jor-El had feared. The possibility that his birth parents, not to mention his entire civilization, could still be alive proved an irresistible lure for Superman." "Scoop!" details the history of the Daily Planet newspaper from its beginnings in the late 1700s. The right page of this two-page spread is taken up by a reproduction of the front page article "The Man of Steel is Back!" as seen in "Superman Returns". There is actually a fully-written article to be read on this front page, detailing Superman's rescue of the Boeing 777 airplane and the Genesis space shuttle. Interesting points from the article include the fact that the baseball game shown was a play-off match at the Metropolis Park Stadium between the Miami Ravens and the Washington Fins; and the Genesis mission was a joint project between the U.S. Air Force and Virgin Galactic. The article is written by Lois Lane. "Superman's Powers" simply relates all of Superman's powers, with details of his Kryptonian physiology and how he uses his powers for good. Of note is the information that Superman's costume and cape are composed of Kryptonian fabric, which can withstant the rigors of supersonic flight without heating or tearing. "The Kent Farm" explores the family home of Jonathan and Martha Kent. It tells of how the farm has fallen into desrepair since Jonathan's death, and especially in the five years that Clark has been away. It reveals that Martha and neighbor Ben Hubbard have struck up a romantic relationship during the time Clark has been away, spending many nights at home playing board games (especially Scrabble, of which Martha is reportedly a champion player), or in town playing Bingo. Martha has also become quite adept at fishing thanks to Ben's guidance. "Crash Landing" tells of Kal-El's return to Earth after five years in space, and simply re-tells the scene shown in the movie where Martha finds her son returned. It reveals that Kal-El is indeed very weak due to the near-fatal kryptonite exposure he endured while visiting the remains of Krypton. "Inheritance" is an interesting 2-page spread detailing the life and wealth of Gertrude Vanderworth and her deceased husband Steven. A reproduction of a Daily Planet newspaper with Steven's photo explains that Steven Vanderworth was the son of a rich family, with shipping fortunes made by his great-grandparents. Steven used his own business skills to expand the company into a vast international conglomerate. This section of the book also details Gertrude's poor taste in art and sculpture, and explains how Lex Luthor managed to win his way into her heart. "Lex Luthor" delves into the history of Superman's arch enemy. A great Daily Planet newspaper reproduction shows Lex Luthor (Kevin Spacey) in a prison uniform with the headline "Luthor Gets Life". It tells of the exploits of his grandfather after World War II, Lex's early university studies in politics, and his vanity and affinity for wigs. We also learn that Lex is a self-taught expert in many sciences, especially in the area of crystals and minerals. "Kitty Kowalksi" tells us all about Lex Luthor's girlfriend. We find out that Kitty first met Lex in prison while visiting a previous boyfriend. A witness to Lex murdering a fellow inmate, Kitty held her tongue about the incident, winning Lex's trust. Kitty learned to be a con artist from her mother, who married rich men and fleeced them of their wealth. Kitty was employed by Gertrude Vanderworth, posing as a maid and nurse, although she never actually did any work. "Does the World Need Superman?" reveals that Lois's article titled "Why the World Doesn't Need Superman" hits Superman hard. His own doubts about his place in the world are only made more real when he first comes across the article (which, in a scene cut from the movie, happens on the Kent Farm, not in Metropolis). While he only ever intends on leading by exmaple to inspire people to greatness, he's concerned that his methods have been misinterpreted. The deleted scenes mentioned are chronicled in both photos and text, describing how Clark, once again finding his baby spacecraft, sees stacks of old Daily Planet newspapers saved aside, and reading through them at super speed, catches up on what's been happening in the world over the past five years. It is during this sequence that he first reads Lois's article on why the world doesn't need him. "Artic Quest" explores Lex's journey to the arctic in search of Superman's Fortress of Solitude. Interestingly it also gives background history for Lex's henchmen, fleshing out their characters. "The Yacht Gertrude" is a detailed tour of the 300 foot yacht Lex uses to travel to the arctic. With various elevations, measurements, and photos, we're given an inside look at the important rooms aboard the Gertrude and learn some of its history. "The Fortress of Solitude" gives us an overview of Superman arctic hideaway and the Kryptonian crystals. It reveals that Clark left home at 17 years of age to journey to the Arctic Circle's Fletcher Abyssal Plain to originally create the Fortress. Interestingly, we're told that "not even polar bears prowl this part of the arctic". Is this making fun of a previous never-used script that had polar bears standing guard outside the Fortress? "Hunt for the Crystal" tells of Lex Luthor's journey to Superman's Fortress of Solitude to steal the crystal technology and his years of studying crystals. It reveals that an artificial storm masks the Fortress of prying eyes. We also discover more details about Lex's on-foot journey from the anchored Gertrude to the Fortress, with photos of footage apparently cut from the movie. "Lois and Clark" shares details of the relationship between Lois and Clark, and Clark's anguish in not being able to tell Lois who he really is. "Superman's Outfit" explores every aspect of the Superman costume, revealing that the "S" is actually the Kryptonian crest of the House of El, symbolizing a pledge to renounce the dishonesty and violence that marred Krypton's past. We find out that the original costume was made by Martha Kent using Kryptonian materials found in Kal-El's baby space pod, but that Superman has updated the outfit using equipment from his Fortress of Solitude. We're told that Superman made a grey one-piece bodysuit for his return trip to Krypton in the hopes that any survivors he found there would recognize the symbol of the House of El. "Metropolis: City of Tomorrow" introduces us to the city of Metropolis, delving into the 200 year history, the architecture, and various iconic locations. "The Daily Planet" is a tour of the building housing Metropolis's great newspaper. While the newspaper has existed for over a hundred years, the famous skyscraper with the globe on top was built in 1932. "Welcome to the Bullpen" introduces us to the hub of the Daily Planet newsroom, and the driving force behind it all... the editor-in-chief, Perry White. "Lois Lane" brings us up-to-date on who Lois Lane is and what she's been doing in the five years since Superman disappeared. We're told she moved from downtown Metropolis to live with Richard White in the western suburbs after the birth of her son. We're also introduced to Richard White, who we discover moved from the Daily Planet's offices in London to head the international bureau in Metropolis. "Jimmy Olsen" introduces the Daily Planet's young photographer, revealing some of his background working as a photographer for lesser publications before working his way up to the Daily Planet. We also discover that Martha had been sending postcards to the Daily Planet from Clark during his time away, with one especially funny one about Llamas catching Jimmy's eye. We're told that Jimmy is concerned over not having had a photo published in nearly two months. "The Return of Clark Kent: Reporter" tells of Clark's return to the Daily Planet as a reporter, finding things have changed quite a lot while he's been away. "The Ace O' Clubs" takes us inside the comfortable watering hole owned by Bo "Bibbo" Bibbowski, one-time longshoreman and boxer. We're told that the tavern is located in a district dotted by boxing gyms, and is often frequented by boxing royalty. We also discover that Clark's super-charged metabolism is not affected by alcohol. "Power Surge" looks at Lex's initial experiment in the Vanderworth Mansion basement where the model railroad resides. It also explores the model railroad itself, delving into its history and various scaled-down versions of real-life locations. "Shuttle Rescue" tells the tale of the space shuttle launch off the back of the Boeing 777. The book does call the mission the "Explorer" mission, which was later changed to the "Genesis" mission in the actual movie (as a tribute to the new Sony Genesis digital cameras used to shoot the film). We're also introduced to Bobbie-Faye, the female aeronautics pro who gives the sales pitch to the reporters on board the plane during the movie. "Superman is Back" looks at Superman's ability to use his super-speed and flight to get to where he's most needed from his edge-of-space listening post. It also examines the rooftop bank robbery scene and the world's reaction to Superman reappearance. "Kitty's Rescue" basically tells the story of Kitty's car troubles in Metropolis, masking Lex's robbery at the Metropolis Museum. We're told that Kitty chose the sleek 1960s Ford Mustang from the Vanderworth mansion's garage. "Museum Heist" examines Lex's plan to steal Kryptonite from the Metropolis Museum of Natural History. We're told the Museum was founded with a grant from tycoon Silas Vanderworth in 1874. This section of the book also explores Kryptonite and its properties. "Lois Lane Investigates" is the story of Lois's investigation into the power blackout, ending in Lois and Jason being trapped aboard Lex's ship. "Jason" introduces us to Lois's son. We discover that Jason was actually born prematurely, surviving a stay in intensive care in hospital, and developing a host of health problems as he grew, which include asthma, allergies to nuts, seafood, wheat, and milk. Interestingly, we find out that the staff of the Daily Planet actually enjoy having Jason around, keeping toys and books in their desks to surprise him. "New Krypton" explores the new landmass created by Lex Luthor. We discover that the crystal used had an embedded blueprint of Krypton, recreating many of its famous landmarks, including the capital city Kryptonopolis, the Valley of Elders, and others. This history of some of these locations is also explored in this two-page spread. "Acknowledgements" is the final page of the book, and lists various people the author thanks for their contribution to the project. I was pleasantly surprised to note that my own name appeared at the end of this list. Writing - 5: I would highly recommend that any fan of "Superman Returns" purchase this book. My review here only touches on the wealth of information and insightful details within. Artwork/Photos - 5: Visually stunning. This book not only presents some great photo stills from the movie itself, but also incorporates some technical drawings, designs and other interesting images to further enhance the text information.